Some things in my life are not going to change. I might as well face this fact. I'm not being negative, I'm just being realistic tonight. I can change my attitude - Zig Ziglar said “Your attitude, not your aptitude, will determine your altitude.” I’m sure none of you act this but I get seriously pissed about some things I can’t change in my life. I will not longer do that because I decided that changing my attitude is a better emotional investment. Whether is a simple task (I know none of you get mad about this, so I’ll assume this is for me) or a boundary issue with other people, my attitude will determine my altitude. I’m for soaring higher and higher friends! I can take a step back and rethink my strategy - When I rethink my strategy, I get new direction. Remember, I already have a better attitude, which will make my new journey productive. When I was working outside of the home and my plate was super full, I developed my 45-minute organization strategy. It really helped me not to be upset about the things I couldn’t change (overwhelming amount of laundry). It gave me new power to use the time I had (1 hour) to fix my issues. I can’t tell you how much this new strategy has helped me till this day! So I challenge you to take a step back and rethink your strategy. I can rely on God to add the super to my natural - seriously, I can and I should rely on God to help my natural self. I have walked with Him enough to know He’s no Santa Claus and He’s not a Genie in the bottle. He’s reliable, wise and He cares about me a whole lot. I have found that these things that bother me are character promotions in disguise. I know. He can even use the small things to get me to be the woman He designed me to be. I should rely on His super to fill my natural every time. 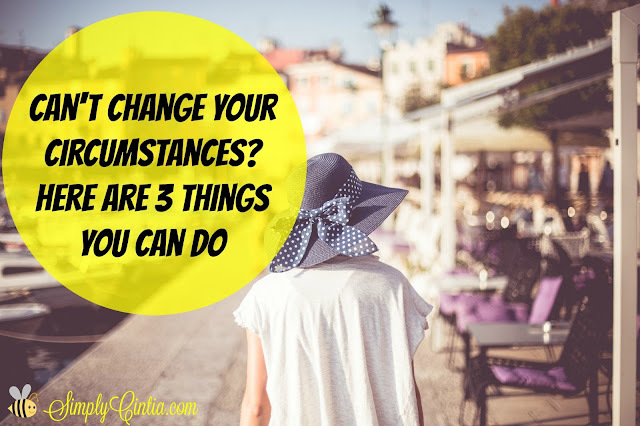 If you have been bothered about something little or big that doesn’t seem to change, remember these 3 things you can change: your attitude, your strategy and your ability to open your natural life to God’s super natural.